Universities once believed themselves to be sacred enclaves, where students and professors could debate the issues of the day and arrive at a better understanding of the human condition. Today, sadly, this ideal of the university is being quietly betrayed from within. Universities still set themselves apart from American society, but now they do so by enforcing their own politically correct worldview through censorship, double standards, and a judicial system without due process. Faculty and students who threaten the prevailing norms may be forced to undergo "thought reform." In a surreptitious aboutface, universities have become the enemy of a free society, and the time has come to hold these institutions to account. The Shadow University is a stinging indictment of the covert system of justice on college campuses, exposing the widespread reliance on kangaroo courts and arbitrary punishment to coerce students and faculty into conformity. Alan Charles Kors and Harvey A. Silverglate, staunch civil libertarians and active defenders of free inquiry on campus, lay bare the totalitarian mindset that undergirds speech codes, conduct codes, and "campus life" bureaucracies, through which a cadre of deans and counselors indoctrinate students and faculty in an ideology that favors group rights over individual rights, sacrificing free speech and academic freedom to spare the sensitivities of currently favored groups. The student at the center of the 1993 "Water Buffalo" case at the University of Pennsylvania, who was brought up on charges of racial harassment after calling a group of rowdy students "water buffalo" -- even though the term has no racial connotations. The Catholic residence adviser who was fired for refusing, on grounds of religious conscience, to wear a symbol of gay and lesbian causes. The professor who was investigated for sexual harassment when he disagreed with campus feminists about curriculum issues. The student who was punished for laughing at a statement deemed offensive to others and who was ordered to undergo "sensitivity training" as a result. The Shadow University unmasks a chilling reality for parents who entrust their sons and daughters to the authority of such institutions, for thinking people who recognize that vigorous debate is the only sure path to truth, and for all Americans who realize that when even one citizen is deprived of liberty, we are all diminished. Alan M. Dershowitz Harvard Law School An eye-opening and well-documented exposé about what could happen to your children when they are sent to even the best colleges in the country. Kors and Silverglate demonstrate that when these colleges, purportedly devoted to liberal education, treat students in disciplinary proceedings, they make the notorious Star Chamber seem liberal in comparison. The Shadow University is a wake-up call for parents, students, and professors alike. Christina Hoff Sommers Author of Who Stole Feminism? A massive, irresistible manifesto for student rights. Kors and Silverglate show how the cultural left's assault on individual liberties is effectively transforming the academy into "an island of oppression in a sea of freedom." Convincingly argued, authoritatively documented in moving human detail, it is a momentous achievement. Wendy Kaminer Author of It's All The Rage and I'm Dysfunctional, You're Dysfunctional Unlike most critics of political correctness, Alan Charles Kors and Harvey A. Silverglate have no political agenda of their own to advance, except the preservation of liberty. They take seriously the obligation to defend the rights of all individuals, adversaries as well as friends. 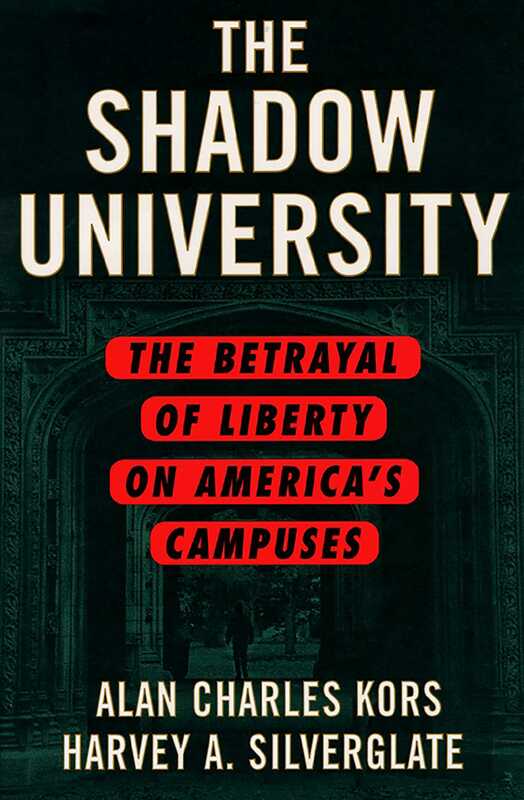 The Shadow University is a scrupulously fair, painstakingly documented account of repression on America's campuses, where students and faculty members are regularly denied fundamental rights of speech, conscience, and due process. I never knew it was quite this bad. Linda Chavez President, Center for Equal Opportunity, and former director of the U.S. Commission on Civil Rights Alan Charles Kors and Harvey A. Silverglate tell a chilling tale of university administrators turned Grand Inquisitors, of students and faculty stripped of their basic due process rights, of a freshman orientation system intended to indoctrinate and intimidate. They expose higher education's underbelly: the assault on liberty and true academic freedom (waged in the name of political correctness and group rights) that is occurring at so many of our nation's colleges and universities. Kors and Silverglate document precisely how inhospitable campuses are today to the pursuit of knowledge and the debate of ideas. Nat Hentoff Columnist for The Washington Post and The Village Voice, and author of Free Speech for Me, but Not for Thee Many of America's colleges and universities, including the most prestigious, have largely abandoned a respect for free speech, due process, honesty from on high, and the very concept of intellectual freedom. In The Shadow University, Alan Charles Kors and Harvey A. Silverglate have created the most far-ranging and in-depth report on the appalling state of American higher education, and their vivid, specific stories should shame those in charge of shaping the minds and spirits of the next generation.